A New eBooks Publisher: PROLOGUE BOOKS. If you like (love) old vintage crime fiction as much as I do, and if you have a Nook, Kindle or other similar electronic reading device, you’re in luck. A new ebook website, Prologue Books, has been in the works for the past few months, and it’s now online at www.prologuebooks.com. My reaction? What a great idea! One whose time has come. The good stuff. The kind of tough, hard-boiled fiction I’ve been reading for over 50 years. Looking through the list of books below, I bought some of them new off the local drugstore’s spinner rack when I was still in my teens. (I still have them.) The others in my collection I had to scrounge up from used bookstores here and there all over the country, from Maine to St. Louis and back again. And here they are again, all spruced up, the dust brushed off and ready for a new generation of readers. Personally all I could wish for are paper editions as well, but this is the next best thing. Believe me, this is the best news I’ve had all week. This past summer’s titles from Ostara Publishing’s Top Notch Thrillers imprint which aims to revive Great British thrillers “which do not deserve to be forgotten” included a 50th anniversary reissue of a classic manhunt; the story of a World War II conspiracy from one of the biggest selling authors of the 1970s; an award-winning against-the-clock thriller; and a Gothic chiller from an author described as the literary link between Dennis Wheatley and James Herbert. Geoffrey Household, the writer widely considered to be the natural successor to John Buchan, had an unrivalled feel for the English countryside and the primitive bond between hunter and prey. 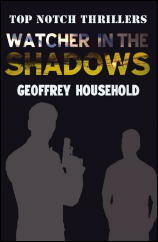 First published fifty years ago in 1960, Watcher in the Shadows is a masterly description of a deadly game of cat-and-mouse which ranks comfortably alongside Household’s legendary Rogue Male. 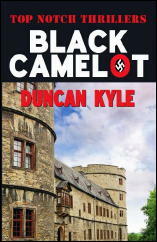 Black Camelot, first published in 1978, combines a superbly researched wartime conspiracy plot with blistering action and rightly led to the author, Duncan Kyle, being favourably compared to Alistair Maclean and Desmond Bagley. Under his real name, John Broxholme was a distinguished journalist and Chairman of the Crime Writers’ Association, but it was as Duncan Kyle that he achieved international fame from the moment his first thriller, A Cage of Ice, became an instant bestseller on publication in 1970. Francis Clifford was one of Britain’s most respected thriller writers from his first well-crafted mysteries in the late 1950s to his untimely death in 1975. His 1974 novel The Grosvenor Square Goodbye was a sensation on publication, won the Crime Writers’ Silver Dagger and was serialised in national newspapers. 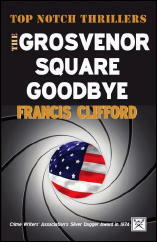 The action of the book takes place in less than 24 hours and begins with a crazed lone gunman bringing the West End of London – and the American Embassy – to a violent halt. But nothing, absolutely nothing, in this ingenious ticking-clock thriller can be taken for granted. 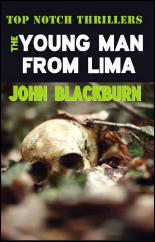 The Young Man From Lima, first published in 1968, shows all the trademark touches which made author John Blackburn “today’s master of horror” (Times Literary Supplement). John Blackburn held a unique place among British thriller writers of the 1960s, adding his own taste for the Gothic and the macabre to the conventions of the thriller, the spy story and the detective novel, and always at a ferocious pace. As a writer he is seen as the literary link between the work of Dennis Wheatley and James Herbert and many of his plots were based on scientific or medical phenomenon presaging the work of writers such as Michael Crichton. Top Notch Thrillers, the new imprint of print-on-demand publisher OSTARA celebrates its first year in operation with the re-issue of two classic British thrillers. 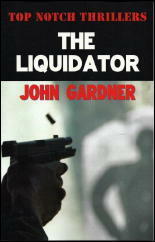 John Gardner’s debut novel The Liquidator was originally written as an affectionate spoof of the James Bond genre and featured the cowardly, accident-prone agent “Boysie” Oakes. Originally published in 1964, shortly after the death of Ian Fleming, the Boysie Oakes books were seen as a natural successor to Bond and in the 1970s, John Gardner (by now an established thriller writer) was approached by the estate of Ian Fleming to continue the 007 franchise. In total, Gardner wrote over 50 novels, the last of which was published posthumously in 2008. Victor Canning (1911-1986) was one of Britain’s best-loved popular novelists, whose first book was published at the age of 23 and whose writing career spanned more than 50 years. 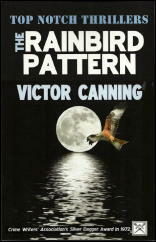 The Rainbird Pattern is probably his most famous thriller and won the Crime Writers’ Association’s Silver Dagger in 1972. It was filmed by Alfred Hitchcock (his last film) as Family Plot. 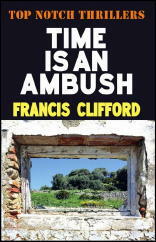 Full details of all Top Notch Thrillers can be found on www.ostarapublishing.co.uk. Titles are available from Amazon (£10.99 in the UK, $16.98 in the US). UPDATE: Nicholas Flower on CHARLES WILLIAMS. 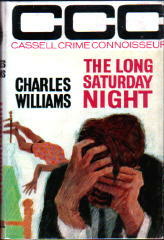 Back in January of 2009, I posted an article by Nicholas Flower about his role in creating new titles for Charles Williams’ crime novels when they were published in the UK by Cassell. The piece was updated in February, and in March cover images of five more dust jackets of books in the Cassell series were added, thanks to Bill Pronzini, along with new commentary about them by Nicholas. 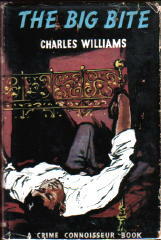 Cassell published fifteen Charles Williams thrillers, though, and until last week there were only twelve that were included in Nicholas’ article. And there things stood, until now, thanks to some helpful online booksellers who very kindly supplied us with images of the three that were missing. All fifteen covers are now part of that original post. I hope you’ll go back and take a look. You can find the post here. I think it’s worth the visit, or even a revisit! ANNOUNCING: A Checklist of Harper’s Sealed Mysteries, by Victor A. Berch. It’s taken me longer than it should have, but this afternoon I finally finished the formatting of a checklist that should be of interest to everyone who reads and collects mysteries published during the Golden Age of Detection. Following in the footsteps of Doubleday, Doran & Co.�s entrance into the mystery series with its Crime Club series early in 1928, Harper Brothers introduced in 1929 an unusual concept for its series. Each publication was to have a certain portion of the mystery story sealed off from the reader at a climactic point in the story. If the reader wished to continue to discover the author�s explanation and solution to the committed crime(s), the reader would then have to break the seal and read on. 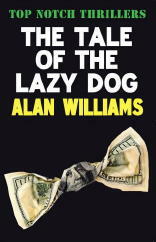 Should the reader lose interest in the author�s story and returned the book to the bookseller with the seal intact, the reader would be refunded the cost of the book. This series of books, obviously very collectible today, was published between 1929 and 1934. 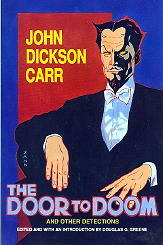 The most prominent author included in the series was beyond a doubt John Dickson Carr, with nine books in the series (in six years!). It’s the cover of one of these that you see here up above. Other authors include Freeman Wills Crofts, Milton Propper, Mary Plum, Hulbert Footner and Albert Payson Terhune. And just how many of the books were returned to Harper’s for a refund? You’ll have to read Victor’s article. ANNOUNCING: An IPL Checklist, by Victor A. Berch. This is Steve speaking. IPL is the short form of a tongue-twister name of a publishing company called International Polygonics Limited. 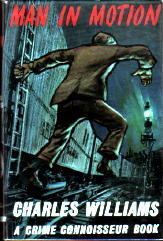 The man behind the company was Hugh Abramson, and the man behind him, working as a series consultant and helping to choose what books to reprint, was Douglas G. Greene, who’s presently the man in charge of Crippen & Landru, publisher of previously uncollected stories of a long list of mystery writers. Together, as the head honchos behind IPL, they put together a long run of paperback mystery reprints, with a soupcon of hardcovers and original novels thrown in. 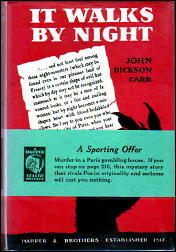 Authors such as John Dickson Carr (and his alter ego Carter Dickson), Margaret Millar, Leslie Charteris, Craig Rice, Clayton Rawson, and George Baxt. Should I name more? I can, and easily. Ngaio Marsh, Ellery Queen, Jonathan Latimer, Charlotte Armstrong, E. Richard Johnson, and Stuart Palmer. All of the above, and others, were among those with multiple titles offered. Among the non-mystery titles IPL published were more than a handful by P. G. Wodehouse. Note that it’s long enough that it takes two full pages, with a link on the first taking you to the second. Be sure you find your way to both pages. This pair of web pages is still being worked on, which is why the checklist has never been announced officially until now. I have many many cover images to add to it, including back covers, and research into some of the non-mystery books remains to be done. But as a checklist of the books themselves, they’re all there, with plenty of cover images already included. It also could use a better introduction and overview of the entire IPL operation, but you can consider this a Preview, with more to come, as soon as I can do it. To my mind, this is an extraordinary run of paperbacks, but because of limited distribution of the books, few people are as aware of their existence as they should be. This checklist should help remedy that — or at least Victor and I hope so! Nicholas Flower on CHARLES WILLIAMS. My father, Desmond Flower, was the Literary Director of Cassell at the time I joined the firm in the 1950s. 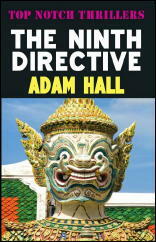 He visited New York every year to buy books for UK publication from NY publishers and agents. 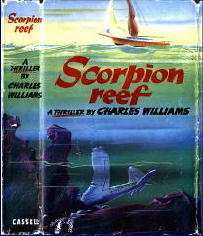 On one of his visits he was given a copy of Scorpion Reef for consideration. 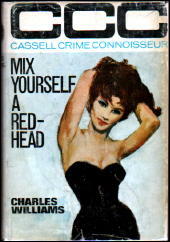 This, the Macmillan (NY) edition, must have been the first hardcover edition of a thriller by CW. My father liked it, bought the rights and we published it in 1956. It was critically well received and this led to the idea of reissuing his Gold Medal paperbacks as hardcovers in the Cassell crime list. As is clear from the order of their publication, there was no correspondence between the order of original Dell or Gold Medal publication and the order in which we republished them. 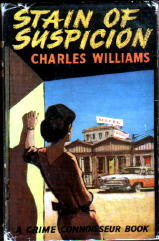 Some of them were republished under their paperback titles, such as The Big Bite, but it was felt that some of the titles, particularly the “Girl” titles, were not right for the hardcover market. It was at this point, before I took over editorial control of the Crime list in 1960, that I got involved with CW, because the pleasant task of thinking up new titles was left to me. Each time we were resetting a book for which we felt a new title was needed, I would write to CW with a suggestion and he accepted every one. 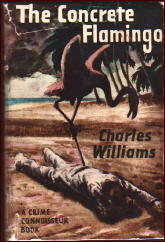 The Concrete Flamingo [Cassell, 1960; previously All the Way, Dell 1958]. The Catfish Tangle [Cassell, 1963; previously River Girl, Gold Medal 1951]. 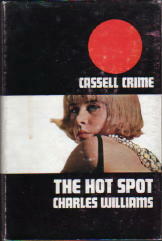 The Hot Spot [Cassell, 1965; previously Hell Hath No Fury, Gold Medal 1953]. Because the decision to reissue earlier titles in hardcover, and to retitle some of them, had been taken by Cassell, the US hardcover editions of Gold Medal reissues followed within the same year. 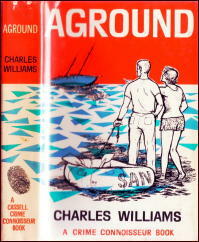 New titles, written by CW after 1958, such as Aground and Dead Calm, went straight into hardcover, the US edition preceding the Cassell edition. The reissuing of the Gold Medal books in hardcover, many with new titles, played a crucial role in the continuation of CW’s success. It led to the creation of a new audience, not least through library sales. It brought him to the attention of critics in the mainstream and publishing trade press where, on both sides of the Atlantic, he was consistently well reviewed. This rebirth of his books led in turn to their reissue, under the new titles, in two further paperback phases: first, following on directly from the hardcover editions, by Pan in the UK, and Pocket Books and Harper and Row in the US; then later, through another phase of reissues, in the 80s and 90s, by publishers such as Penguin and No Exit Press. The photo attached is one I took of Charles Williams on the top floor of the Cassell building in Red Lion Square, London, in the early 60s. On the literary side, I have always divided his thrillers, not into sea vs land, but into water vs land. In all the books which contain boats, fishing, water and swamp, there is a deeply nostalgic and pervasive atmosphere of mystery – smooth water providing both a feeling of calm and of hidden menace. 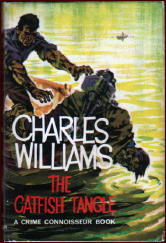 There is no better example of a water novel than what I retitled The Catfish Tangle, the title referring to the catfish which Shevlin catches for the restaurant at the head of the lake. 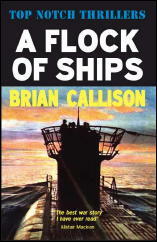 In the 60s, Cassell and Collins were the pre-eminent UK publishers of blockbuster novels. Our authors included Alec Waugh, Nicholas Monsarrat, Irving Stone and Irving Wallace. The last time CW visited our office, I put to him the idea that he could write a wonderful full-length novel using a liner as the setting. 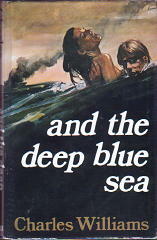 And the Deep Blue Sea ((Signet, pb, 1971; Cassell, 1972) is, in my opinion, not really a sea novel; the liner in the book is merely a platform for psychological interplay and misdeeds. I do not think it is successful as a thriller, but it clearly shows what he could have achieved through his powers of characterisation had he been prepared to work on a bigger canvas. Might it have revitalised his career? Sadly we shall never know. He said no; he was happy doing what he knew best and felt he was too stuck in his ways. NOTE: For an essay by Bill Crider on Charles Williams, along with a complete bibliography, follow this link to the primary Mystery*File website. [UPDATE] 02-01-09. After making a couple of minor edits in the piece above, Nicholas and I have been discussing some of the other books by CW that Cassell published. 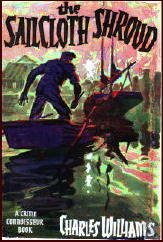 One of them was The Sailcloth Shroud, which was published first in the US in hardcover (Viking, 1960; Cassell, 1960). “I left Cassell in 1970 following the take-over of the company by Crowell Collier Macmillan of New York. 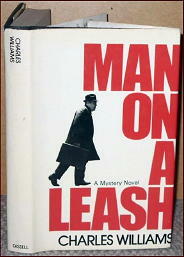 By then all but one of CW’s novels, Man on a Leash, had been published. [UPDATE #2] 09-11-10. 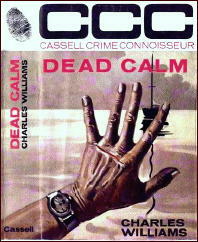 Twelve covers are reproduced above, but Cassell actually published fifteen of Charles Williams’s thrillers, not including his comic crime stories, such as The Wrong Venus and The Diamond Bikini. For these last three covers, thanks to Nigel Williams Rare Books, London, for the cover image to Aground; to Instant Rare Books of Auckland, New Zealand, for Dead Calm; and to The Antique Map & Bookshop, Puddletown, Dorset, for Man on a Leash. Finally, a special note of thanks to Mark Terry of www.facsimiledustjackets.com, who earlier supplied the cover of Scorpion Reef, and to Bill Pronzini, who sent me all the others. A Request from RAMBLE HOUSE. “Ramble House has just released its fourth Rupert Penny mystery, The Lucky Policeman, available at the Ramble House web site and their Lulu store. That leaves four more Penny books to bring back for modern readers. “Ramble House has few resources for finding and acquiring these books and in the past has relied on generous collectors who have loaned us copies of the book to scan, OCR and edit. If you have one of the remaining Penny books � in any condition, in fact, the worse the better � and would loan it to me, I will return it as soon as I�ve got the book edited and will send you a copy of the Ramble House edition as soon as its available. Between 1937 and 1941 British writer Ernest Basil Charles Thornett wrote several puzzle-oriented mysteries that until now have only been available in the UK. Using the pseudonym Rupert Penny and the first person friend of Police Inspector, Tony Purdon, the author takes you to the stodgiest of English manors where murder dwells, if not reigns. Inspector Beale must use all of his puzzle-solving skills, including acrostics and elaborate timelines, to track down the murderer in classic not-so-cosy style. 1938’s The Lucky Policeman takes Tony Purdon and Inspector Beale to an insane asylum where an inmate has escaped and townspeople are dying from a mysterious spike to the lower brain. And they are all missing their left shoe!